DCF77 is a longwave time signal and standard-frequency radio station transmitted from Mainflingen, about 25 km south-east of Frankfurt am Main, Germany (50Â°0â²56â³N 9Â°00â²39â³E). Some of the more technical details can be found on the Physikalisch-Technische Bundesanstalt website. This page details some brief experiments with DCF77 reception in London. The receiver I used a Conrad DCF Receiver Board which is a complete DCF77 receiver with NPN open collector outputs, working on a large voltage range (1.2 – 15V) at around 3 mA according to the datasheet. I had a nose around the internet, thinking that I would first try with an Arduino test bed. 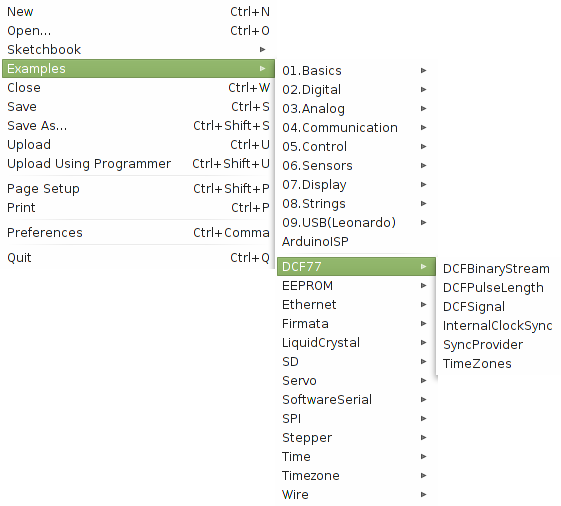 I found this excellent tutorial detailing Arduino interfacing signal recovery and an Arduino library. I set off playing! 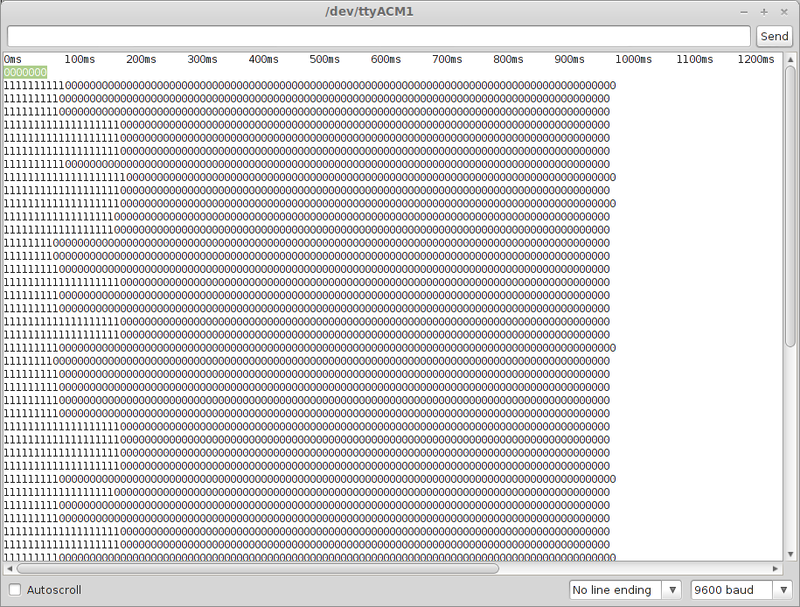 The first piece of Arduino code, lifted from here shows the state of the logic output of the DCF77 receiver. Ideally, there are series of pulses either 100 or 200 ms long every second. This code starts a new line every time a rising edge is received, and shows the logic state of the pin with time. The below image shows the output of this code. You can see a selection of pulses ranging in time from ~100 ms to ~200 ms. 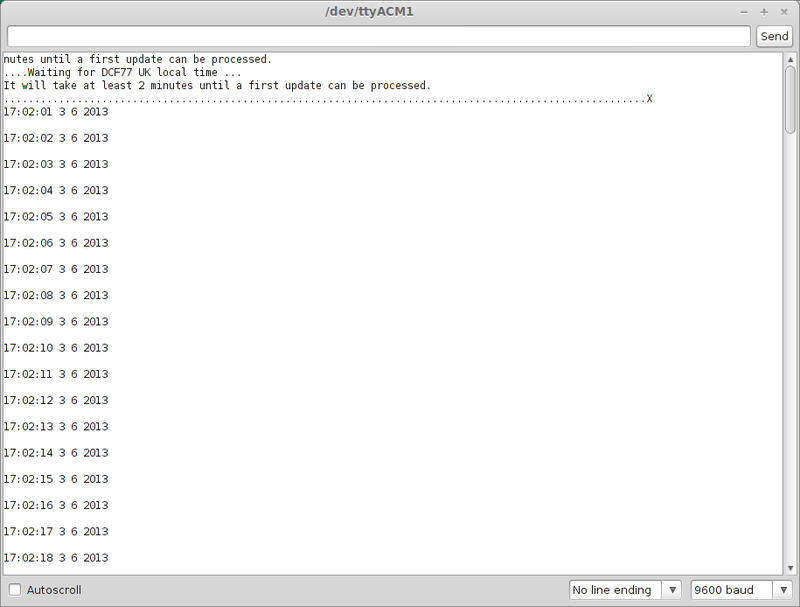 The code timing is slightly out but is good enough at this stage. We can confirm that we are indeed receiving DCF77. The next section of code shows the time between each rising edge (cycle) and the duration of the pulse (pulse). 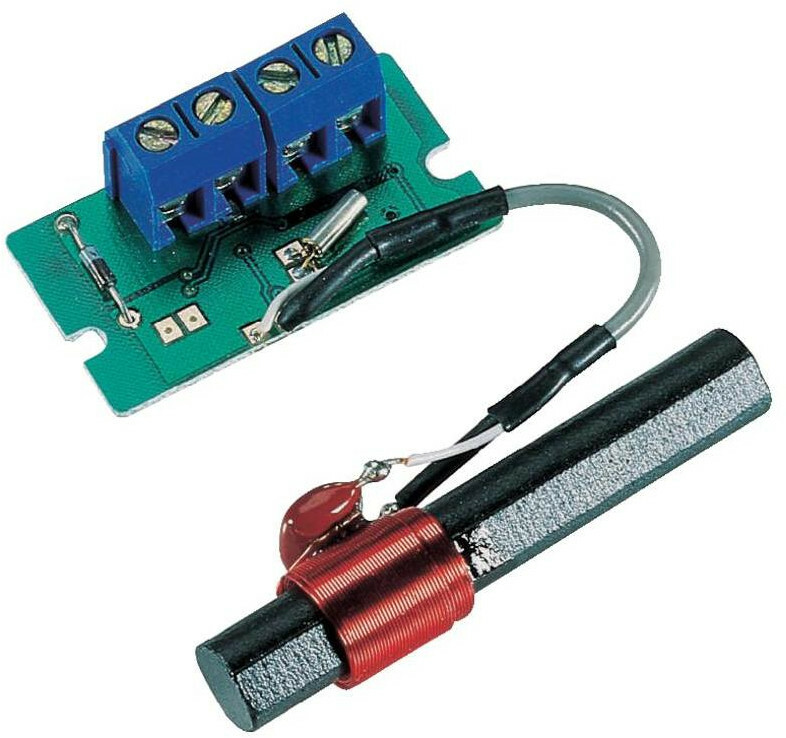 These two things are the key to decoding the data from the DCF77 signal. Code from here. The image below shows the output again. As you can see the cycles last ~1000 ms (approximately) and pulses are either 100 or 200 ms.
After some toying around, I managed to get the DCF77 decoded time to appear in a usable format on my Arduino LCD display. 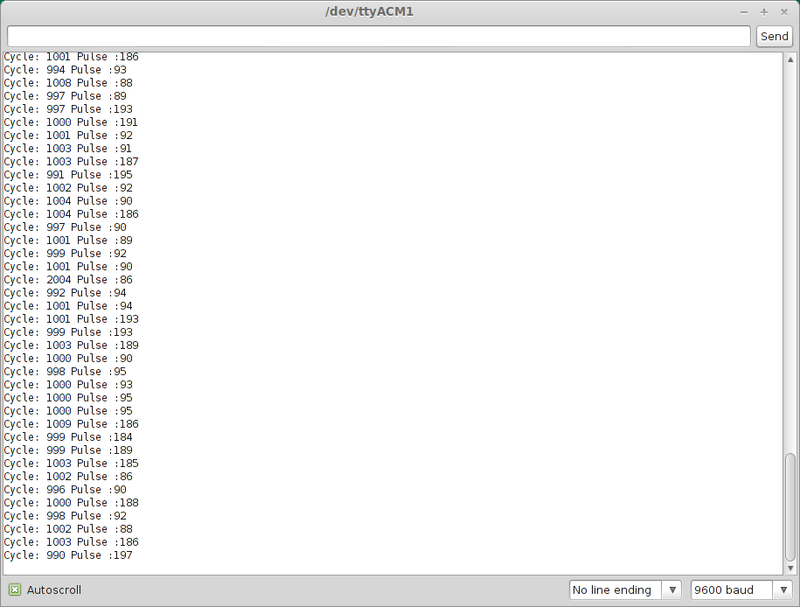 We also see that it took roughly an hour and a half for me to write a simple parser for the time! Shocking! Left shows the original attempt, and right shows around another half hour later, I have the formatting a bit nicer. 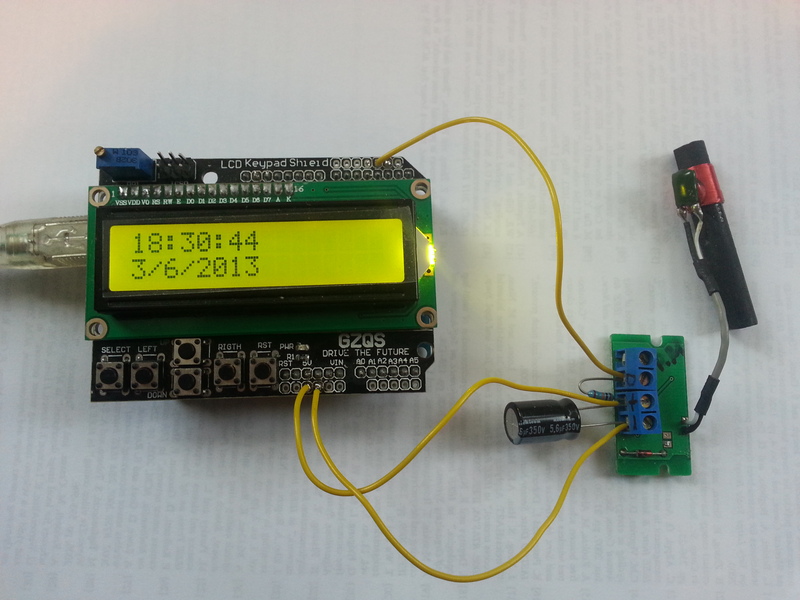 Only so much you can do with a 2×16 LCD. The source code for the below project is here. Great stuff. 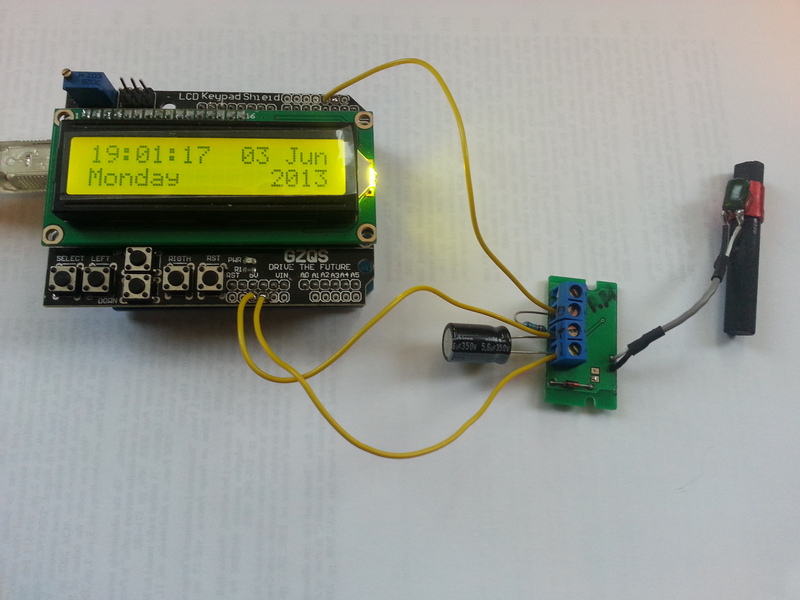 I’m hoping this may be the next step towards my Arduino WSPR MEPT. Currently I am using a GPS receiver and parsing the time with TinyGPS which works great, but uses much more power than the 3 mA quoted for the Conrad DCF Receiver Board.